This was a fun project, and it’s part of my 2012 stash-busting resolution to knit primarily from the stash. I seem to be on a hat kick, I’ve been eyeing several patterns like the Hannah newsboy hat, the Ekaterin slouch hat, the Pineapple Upside Down Hat, and Zumthor. 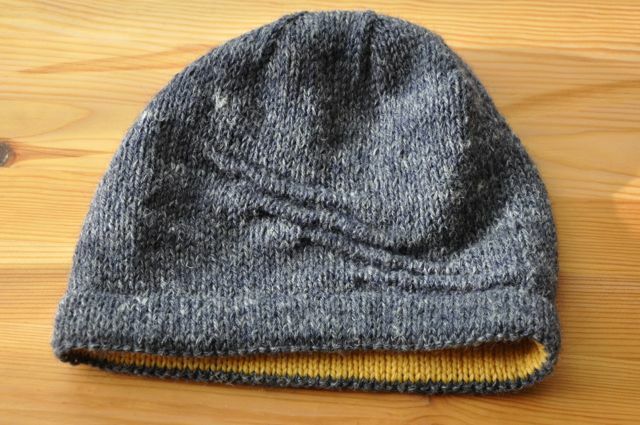 There’s also two knitspot patterns with fun names, Fartlek Hat ("speedplay" in Swedish, a form of interval training) and Slöfock Cap (it’s Swedish for "slouch" according to the designer). This is the first hemmed hat I’ve made. I’ve done this with socks before, on this pattern had you switch from the contrast colour to the main colour a row before doing the hem purl row, which is new to me and looks really good. I did deviate from the pattern over the short rows, they were done as wrap and turn because when I followed the pattern instructions I got holes. Love the welts, I’ve never done them before. They were easier if you prepared them in advance by putting all the stitches to be welted on a spare needle. I had to ignore the pattern directions in order to get the decreases to line up, which was annoying. The yarn is light for a worsted weight, and it has fibres of hemp loosely attached. I like the heathery look, but I’d use this for sportweight patterns in future. The Slöfock Cap made it into the next project slot after a gauge miscalculation on socks means I made the hem way too big, and hems are fiddly enough even without splitty Tofutsies yarn that the socks are on timeout until I finish sulking. Love the welts and the contrast hem. I like including little secret splashes of color. Have you seen this hat? It’s the one I’m currently sitting-on-my-hands-so-I-don’t-cast-on for. Love the cables!